The Austrian National broadcaster ORF, who were celebrating their 60th anniversary, hosted the conference in October 2015. The event in recent times has been professionally video recorded and an edited selection of the various presentations have been made available on the FIAT/IFTA YouTube channel. This year Media Management students from the University of Applied Sciences, St.Pölten, Austria, video recorded the event. This was undertaken as part of their studies and was organised in co-operation with ORF, and the Technical Museum of Vienna. The opening reception was held in a TV studio of ORF and the main event was located at the Technical Museum. 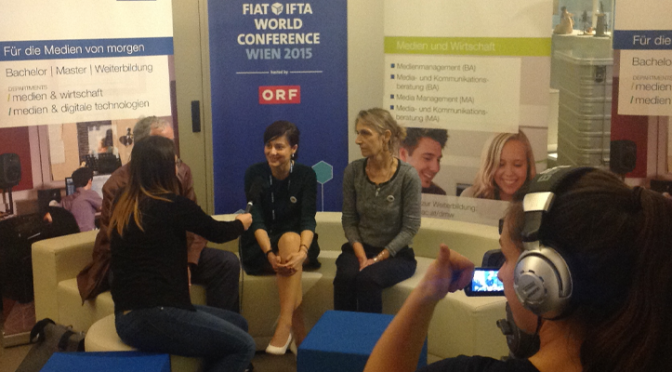 This collaboration (between FIAT/IFTA and the university) came about through established links with the ORF archive. It was seen as a good way for FIAT/IFTA to offer experience to media students to work on a production. Over 30 students participated under the direction of their Professor, and technical support personnel. Planning was key to making this exercise successful. There was a main auditorium, and two conference rooms in an adjoining hotel that needed to be video recorded. In addition to this, the students had two mobile crews who carried out video interviews with presenters and sponsors of the event. An editing team (see photo below) made up from the students were responsible for taking the recordings and making clips and uploading them. Their Professor and technical staff who monitored the workflow supervised the students. The production ran very well and the President of FIA/IFTA congratulated the team in the closing session of the conference. EUscreenXL partners were actively involved in the conference programme, representing their own institutions as well as the developments performed under the EUscreenXL project. On the pre-conference day Maria Drabczyk (NInA), Marco Rendina (LUCE) Arne Stabenau (NTUA) supported by Xavier Jacques-Jourion (RTBF) ran a workshop ‘EUscreenXL – How to delight the eye as well as the mind’. The focus of the presentation was on the practical challenges and benefits of making audio-visual content and metadata manageable, searchable, findable, and accessible for future re-use. It gathered participants not only from European archival institutions but also from USA, Australia and Japan. The presentation was divided into two parts. The first one, dedicated to the technical environment, introduced innovative solutions enabling and securing high-standards in content annotation, discoverability, contextualisation and publication. EUscreenXL as a project emphasizing innovation creates also new tools. The EUscreen publication tools will allow users to create and share collections of videos. A tool which is still under development by NTUA is an application geared towards researchers and professionals which provides access to content and metadata from a multitude of sources, including collections beyond the EUscreen portal, such as Europeana, Youtube, Digital Public Library of America, and Flickr. In the second part, the team showcased how EUscreenXL reaches out to various types of audience and users building on the back-end developments including the collaboration with Historiana and contribution to EUscreen’s first physical, travelling exhibition – Freedom Express. The FIAT/IFTA conference also reunited the Television Studies Commission (TSC), where members from EUscreenXL and VIEW Journal of Television History and Culture are active. On the first conference day, the TSC presented the workshop ‘Crossing Bridges: Archives and Academic Publishing’, moderated by Herbert Hayduck, head of the ORF Multimedia Archives, vice-president of FIAT/IFTA and chair of the TSC. Showcasing the example of VIEW Journal of European Television History and Culture, the workshop brought up for discussion how the digitization of archival material and consequently, the growing online availability of archival content have been changing the form and practices of academic publishing in the field of television history. The workshop panelists were Claude Mussou, head of the InaTHEQUE and member of the VIEW editorial board, Steve Bryant, Senior Curator of Television at the BFI National Archive and Dr. Dana Mustata, Assistant Professor in Television Studies at the University of Groningen and managing editor of VIEW. After an introduction of the multi-media, open access journal VIEW, Dana Mustata spoke about how the digitization of archives and the increasing online access to archival content has generated new forms and formats of publication (e.g. multi-media texts, video essays) and new practices of collaboration between archivists and academics. She emphasized how these new forms of publication open up the specialized field of academic publishing to the language of the television archivist and the broadcast professional, making these players an active part of the production of knowledge on television history. As part of these discussions, Dana Mustata highlighted several challenges such as: mediating a common professional language between academics and media professionals; going beyond national histories to produce European histories of television; dealing with the copyrights of audiovisual sources; integrating new narrative forms and presentation formats that fit the professional skills and working routines of both academics and media professionals. Claude Mussou continued the discussions, presenting the forthcoming issue of VIEW on ‘Archive Based Productions’, an issue guest edited by two archive professionals: Claude Mussou and Mette Charis Buchman, from INA and DR Archives respectively, two institutions actively engaging with archive-based productions. Claude Mussou explained the overall rationale behind the topic of ‘archive based productions’ and gave an overview of the various topics academics and archivists engaged with in their contributions to this issue. These various topics ranged from the re-use of archival material in documentaries, to new trends in (re-)using archives, to ethical issues and best practices of archival reuse, to different approaches to the concept of ‘archives’: archives as proof, evidence and testimony; archives as a reflection of reality or archives as a work of art. Steve Bryant, one of the contributors to the special issue of VIEW on ‘Archive Based Productions,’ zoomed in on a concrete example of how expertise from within the archive can add neglected topics of discussion to the field of television history. Focusing on the use of archive footage in new programmes, Steve Bryant spoke about how changing technologies and programme-making conventions have inevitably led to the incorrect usage of archival footage in new documentaries. In particular, he discussed how the introduction of widescreen television affected and continues to affect the aspect rations in which archival materials are presented. An entertaining clip on the relations between the introduction of different television screens and aspect ratios. The workshop sparked engaging discussions on how the collaboration between academics and archivists could be strengthened as part of producing and publishing online television historical narratives and how to push forward discussions on copyrights across Europe. Read also: Archive Innovation Management by Michael Vielhaber. Photo by Andy O’Dwyer: Students recording an interview with speakers at the event.